Even if you have never heard of Joe Caro, if you are a fan of most any genre of music there is a good chance that you have listened to his work before. He is one of New York City’s most in-demand session and touring guitarists, and he took up the instrument when he was eight after seeing the Beatles on TV. He is well versed in blues and jazz, but he has worked with huge pop and rock artists, with credits that include Crosby, Stills and Nash, The Eagles, Stanley Clarke, Bobby McFerrin, Bon Jovi and Clint Black. But Caro is also an inspirational bandleader, having formed BFD with Late Night’s Will Lee and drummer Steve Ferrone and subsequently tearing up the New York club scene. This group made a name for itself by featuring storied guest artists such as Pat Metheny, Donald Fagen, Michael McDonald and the Brecker brothers. And more recently he fronted the Met Band who gigged every Tuesday at the Metropolitan Café over a period of eight years. Joe Caro and the Met Band’s new release, Live in New York City, was recorded at Drom, which is the epicenter of music in the East Village. His line-up for this show was truly an all-star list of players that included Randy Brecker and Lew Soloff on trumpet, Anton Fig on drums, Blue Lou Marini on the sax, Clifford Carter behind the keyboards and Conrad Korsch on bass. Of course Caro played the guitar and handled the vocals, but he was also the co-producer of this project, along with Roman Klun who took on the recording, mixing and mastering chores. This album has a wonderful blend of modern blues that makes for a pleasurable listening experience, and it is a joy to hear professional musicians who are at the top of their game. The often-covered “Labor of Love” by Tim Kaihatsu kicks off the set and these guys nail it. Joe’s voice is clear and strong, but this cut is not about the lyrics as each member gets the opportunity to show their chops. After hearing all of the solos it is apparent that this is a very well recorded show as the level is even for the voice and each instrument, and the overall sound is as clear as a bell. Klun did a fabulous job here! Next up is a killer Denise LaSalle song from 1975, “Someone Else is Stepping In.” It is awesome that 40 years later her lyrics are so convincing that it is easy to picture her new way of wearing his hair now that she is a brand-new woman. Korsch holds down a fat bass foundation on this 10+ minute track with some help from Carter on the organ and Letterman’s Anton Fig on the drums. This one is considerably more complicated than the usual 12-bar blues, and as things move on the listener is treated to an extended guitar solo from Caro as well a trumpet battle between Brecker and Soloff. Caro penned five of the songs that the band played on this evening, and the first of these is “In the Name of God,” which holds up examples of the excuses that people make for the terrible things they do. This blues song has pop undertones, but also a heavy dose of jazz and the horn section is up to the complicated arrangements. This is followed up by another original: “Upper East Side Blues,” a song of modern worries that hits too close to home in these troubled times. It has a cool layout, as it is a fairly traditional five-minute slow blues song with a six-minute rumba/fusion instrumental interlude in the middle. One of the standout tracks on Live in New York City is another original, “Love Don’t Bother Me,” a funky rocker which is pretty much a drum solo with a song happening on top of it. The band stays tight throughout despite huge swings in tempo and dynamics, making this an exciting listening experience. But it is not fair to call out a favorite, because there is not a bad song on this disc. After the final song ends (appropriately titled “Going Home”) it seems like a shame that 78 minutes have already passed and there is nothing else coming. 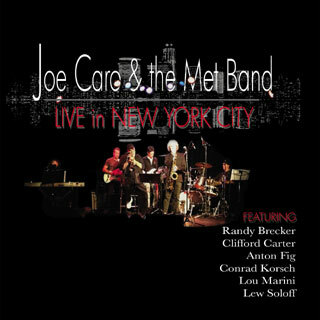 It is undeniable that Live in New York City is an excellent album, and it captures the energy and refined talent that Joe Caro and the Met Band brings to the stage. It would be a fine addition to most anyone’s CD collection, but after a listen it will also make you want to track down one of their live shows. At this point it looks like you will have to go to New York City to see them, but their website says there are plans for a tour. Stay tuned!